Darrell Gwynn: NHRA TopFuel-Driver: Mike Dunn Nology Engineering is rewriting the book on ignition systems and judging by the success of their products, they know what they are talking about. 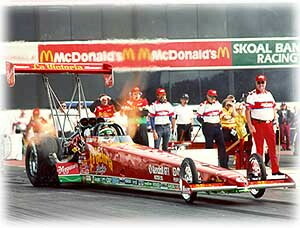 At the 1992 Slick 50 Nationals, in Houston, one of their products was installed on the Jack Clark owned Top-Fuel dragster when driver Mike Dunn ran the sport's then fastest speed of 297.12 mph. Since then, the list of people using Nology's ignition products has grown to be as impressive as the success that these same people are having using the Nology products. "Big Daddy" Don Garlits, for example, was there right from the beginning and has been rewarded with several runs close to 300 mph, (298 mph and 299 mph, respectively). Joe Amato has had two of the quickest runs ever at 4.751 sec. and 4.757 sec., and at the 1993 Winter Nationals in Pomona, Cory Mac completed an unbelievable three runs back-to-back at 300.60 mph, 301.50 mph and 302.21 mph. Jack Clark's Taco Bell Dragster at 304 mph, as well as Kenny Bernstein in the Budweiser car at 306 mph, are the newest additions to the impressive results that are proof positive that at Nology Engineering, they know what they are talking about. What's the secret to their success? The secret lies in their unconventional approach to designing ignition systems. Every other ignition system manufacturer is boasting about how long the spark duration of their system is. They'll tell you that their system has the longest spark duration, usually around 1 to 3 milliseconds, (thousandths of a second). When looking over the sales brochure for one of Nology's ignition systems, you also find a claim for spark duration, the shortest spark duration in the business. What do they know at Nology that other manufacturers don't? Anyone who had physics in college knows the formula for power. In this case we're referring to ignition spark power. Power equals work divided by time (P=W/t). Thus, to get more power, you need to do the same amount of work in less time. Sounds simple enough! Manufacturers of conventional ignition systems though, want you to believe that it is possible to increase the power of ignition systems by lengthening the spark duration. This is not true! Lengthening the spark duration actually reduces spark power, as we already know P=W/t (Power=Energy/Time). Let's look at the process of igniting the mixture in the combustion chamber. The coil is charged up until the voltage at the spark plug electrodes reaches the ionization point. When the ionization point is reached the electrical energy jumps the spark plug gap, creating a spark. If the spark is powerful enough, the fuel mixture in the combustion chamber is ignited. The faster the process of igniting the fuel, the faster the flame front growth and the more powerful the igniting spark, the more complete the combustion. With this in mind, one has to wonder what a long spark duration is good for? A good analogy would be if we were to burn 1,000 gallons of gasoline over a period of 47 days, or blow it up, all at once, in a gigantic explosion lasting only 1 second, (P=W/t). The energy released is the same, but the latter is much more powerful. By obeying the laws of physics and applying them to their ignition systems, Nology is able to build ignition systems with truly impressive performance data. Their claims are backed by the success that their systems are having on the racing circuits. We also find, when running an engine at 7500 rpm or more, there is no time for a long spark duration. First, the engine manufacturer recommends a precise ignition timing, but the spark has a long duration? That doesn't sound right. You don't want the spark to ignite the fuel mixture sometime during it's duration, but at a precise moment, namely the recommended ignition timing. Secondly, if the spark is powerful enough to begin with you don't need a long duration, only a big enough spark lasting a few nanoseconds. Furthermore, the spark of a conventional ignition system with a duration of 3 milliseconds at 7500 rpm will take 135 degrees of crankshaft rotation to complete. Not a very precise ignition timing, and a lot of wasted energy. Nology's ignition system needs less than one degree of crankshaft rotation to complete. With a spark duration that short the ignition timing is much more precise, and when all the spark energy is released at once spark power is increased subtantially. Flame front growth is much quicker and combustion more complete, resulting in increased horsepower and a cleaner burn. And because an ultra powerful spark can ignite more fuel, you can raise fuel flow, increasing horsepower even more. To summarize Nology's ideology on ignition systems is easy, get the job done quickly and with a big bang. It seems to work.